Port Blair, Sept. 21: The Lt Governor, Lt Gen (Retd) A. K. Singh, PVSM, AVSM, SM, VSM, today visited the Central Agricultural Research Institute (CARI), Garacharma. 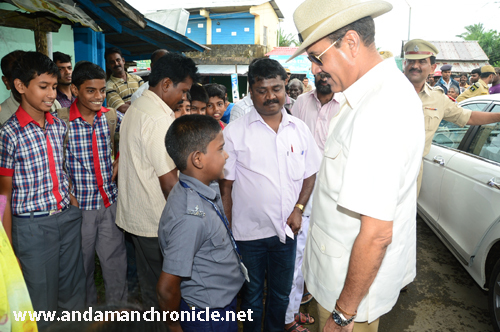 He planted a sapling in the precincts of the complex and visited the Library to see the books and the exhibits there. Chief Secretary, Shri Anand Prakash, Secretary to LG, Secretary (Agri./Fisheries &AH) and officers of these Agriculture, Animal Husbandry and Fisheries Departments were also present. A presentation on various activities carried out by CARI was made to the Hon’ble Lt Governor by the Director, CARI, Dr. S. Dam Roy. While complimenting CARI for taking up various research activities, he observed that the benefits of the research taken up by CARI should reach out to the farmers and fishermen. He also advised CARI to include processing and marketing in its activities. He further issued directions for conducting regular interaction between CARI and the Administration by holding meetings on quarterly, half yearly and annual basis under the Chairmanships of Secretary (Agri/Fisheries & AH), Chief Secretary and the Lt Governor respectively. He suggested that CARI should conduct an audit of the research activities to assess their effectiveness. He further suggested that CARI should shift its focus from the usage of chemical fertilizers pesticides to organic farming and if required, organize exposure trips for farmers. On the fisheries front, the Lt Governor stated that the major thrust of CARI should be towards exploiting the huge potential for the fisheries development in view of the vast marine resources available in the Territorial waters of the Islands. He laid emphasis on exploring the possibilities of creating canning and marketing facilities. 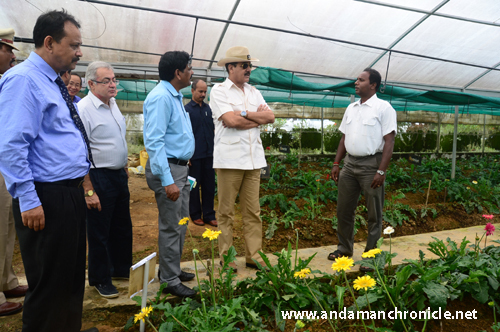 Thereafter, the Lt Governor visited the Poly House & Integrated Farming System model at the Garacharma Research Complex. 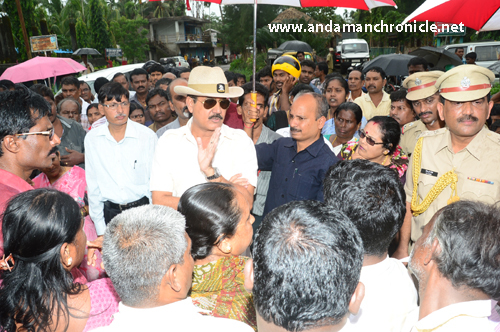 Later, the Lt Governor visited World Coconut Germplasm Collection (WCGC) Farm at Sippighat Farm. On the way, the Lt Governor stopped by the roadside at Bathubasti to listen to the grievances of the people about the poor road conditions. He gave necessary directions to the Panchayat Samiti to complete the work by 1st of November 2013 and include another stretch of new road in the next year’s plan.